The Dalian Shipbuilding Industry Company, traditionally China’s largest shipbuilder, has launched its second Type 052D Luyang III-class destroyer—dubbed “Chinese Aegis”—on August 3 in Dalian in Northeast China, IHS Jane’s Defense Weekly reports. It is only the second vessel of its type built at the Dalian New Shipyard. The first Type 052D Luyang III-class destroyer is currently being fitted, with a third ship to be launched in the immediate future. Other vessels of the class have been built by the Jiangnan Shipyard, located on Changxing Island in Shanghai. The shipyard has built eight Type 052D Luyang III-class destroyers so far and launched its ninth vessel this July. 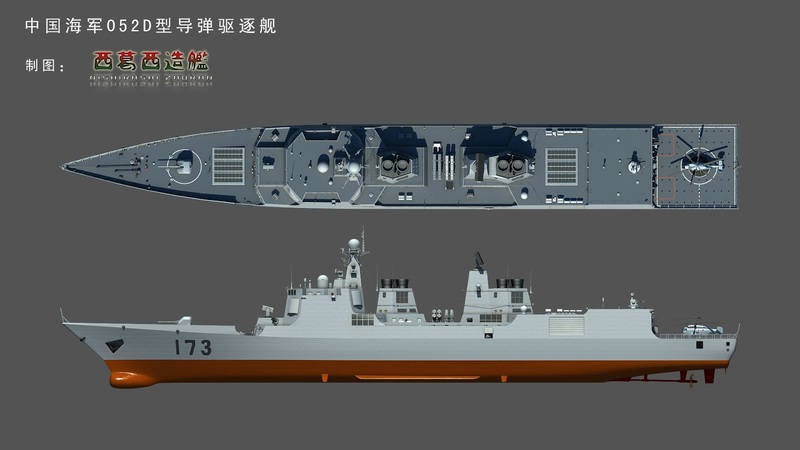 At least four more are planned, indicating that the number will go beyond the initial number of 12 Luyang III-class vessels before shifting production to the newer Type 055D multi-role cruisers. The Type 052D destroyer class is part of China’s overall anti-access/area denial (A2/AD) strategy and has purportedly been specifically designed to repel attacks by enemy aircraft carrier strike groups, submarines, and anti-ship missiles. Type 052D Luyang III-class destroyer is equipped with 64 vertical launch cells, each capable of carrying one to four missiles. The ship carries one of the PLAN’s deadliest anti-ship cruise missiles (ASCM), the vertically-launched YJ-18 ASCM. Next to its YJ-18 arsenal, Type 052D guided-missile destroyers are also equipped with modern HQ-9 surface-to-air-missiles. The layout of the 052D destroyer is similar to that of the earlier 052C, but the superstructure of the 052D slopes inward at a greater angle, providing reduced radar cross-section. Some analysts have said that the overall performance of 052D destroyers is superior to that of Japan’s Atago-class destroyers, South Korea’s Sejong the Great-class destroyers and the U.S. Navy’s Arleigh Burke-class destroyers. But compared with Arleigh Burke-class destroyers, China’s type 052D destroyers are inferior in terms of quantity, displacement and ship-based guided missiles. China needs to build larger models, including a 10,000-ton guided-missile destroyer. Furthermore, the country needs an increase in the quantity of guided-missile destroyers, as China will build more aircraft carriers in the future. Since China does not currently have cruisers, larger guided-missile destroyers are needed to play the role of cruisers. China launched the lead ship in a follow-on class, the LUYANG III- class DDG (Type 052D). Jane’s Fighting Ships 2011-2012 stated that this ship was launched on November 28, 2010, and was being built to a modified version of the Luyang II design. 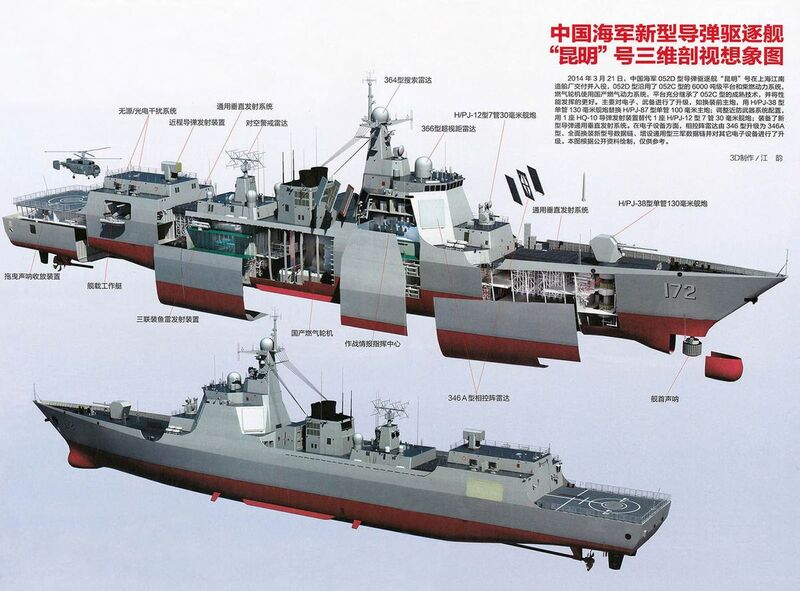 Jane’s expected three further ships in this Type 052D class. This unit entered service in 2014. The LUYANG III incorporates the PLA Navy’s first multipurpose vertical launch system, likely capable of launching ASCM, land attack cruise missiles (LACM), surface-to-air missiles (SAM), and anti-submarine rockets. 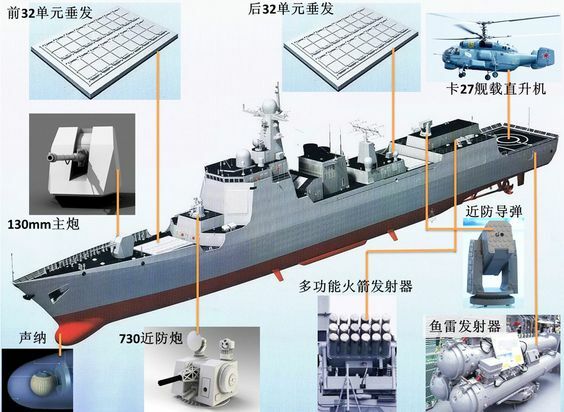 In 2015, military analyst Li Li claimed the Type 055 would have two 64-cell VLS grids (one fore and one aft) carrying YJ-100 long-range anti-ship cruise missiles, anti-submarine missiles, and anti-aircraft missiles. The United States believes the ship would carry YJ-18 anti-ship cruise missiles. In 2015, the U.S. believed that construction could begin as early as 2016, and has tentatively classified it as a cruiser due to its size. 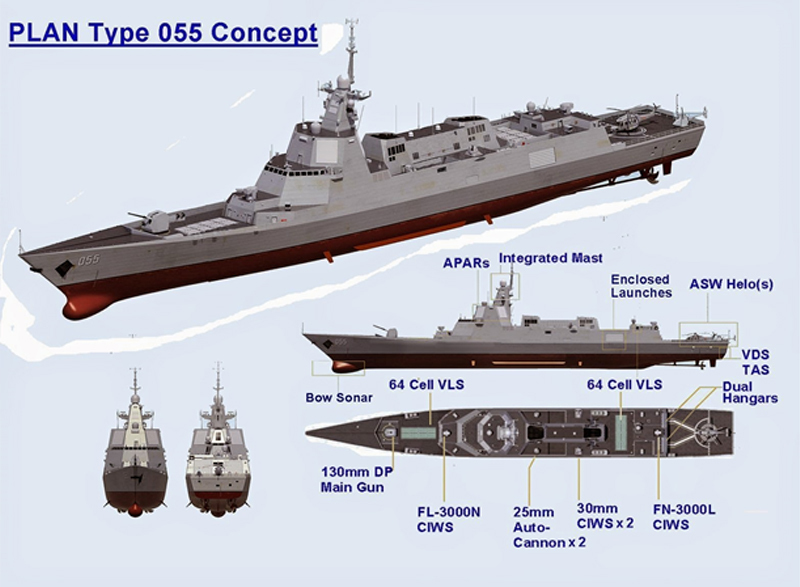 Chinese sources claimed the first Type 055 was ordered from the Jiangnan Shipyard in August 2014, with construction starting in December 2014; the second would be ordered from the Dalian Shipbuilding Industry Company. In an interview in 2015, Rear Admiral Yin Zhuo countered Western media claims that the Type 055 represented a ‘game changer in naval warfare’. He regarded the Type 055 as equivalent to the U.S Arleigh Burke-class destroyer and the emphasis of its estimated 10,000-ton displacement was exaggerated; the existing Japanese Atago-class destroyer is over 9,000 tons, the American Zumwalt-class destroyer is over 12,000 tons, and the Russian Udaloy-class destroyer is over 8,000 tons. 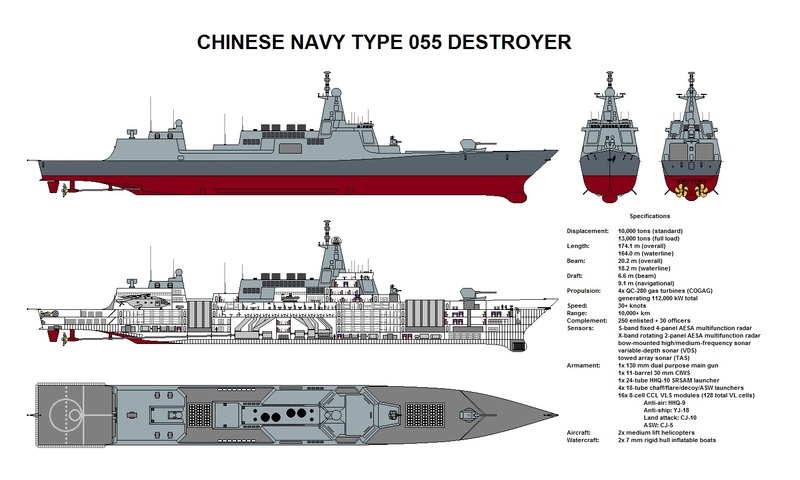 Further stated that if the Type 055 were to mount laser weapons or electromagnetic railguns, the ship would require integrated electric propulsion to power such energy intensive systems. The US has 62 Burke class destroyers. They have an overall length of 505 feet (154 m) to 509 feet (155 m), displacement ranging from 8,315 to 9,200 tons, and weaponry including over 90 missiles, the Arleigh Burke class are larger and more heavily armed than most previous ships classified as guided missile cruisers. The US will build up to 14 more Burke destroyers for a total of 76 Arleigh Burke destroyers.